Along a busy road in South Oxnard there is a 34-acre lot filled with swaying grasses. The occasional coastal bird lands in the field, on its way to a nearby wetland preserve. Children walk past and dream of what the lot could become—a park, a pathway to the beach, a place of refuge in the crowded neighborhood. The lot stands in stark contrast to the industrial surroundings. On the lot’s eastern flank lies a railroad, trucking facility and warehouse for the nearby Port of Hueneme, along with a recently shuttered power plant. At its western edge sits the city’s wastewater treatment plant, a cardboard recycling factory that spits out a constant stream of white plumes, and a toxic waste site left behind by a defunct smelting operation. For years, this oddly peaceful plot of land has represented a beacon of hope for many local residents. Behind its empty expanse lie the beach and a wetland preserve, an area long inaccessible to the people of South Oxnard, a mostly Hispanic and low-income community in Ventura County. 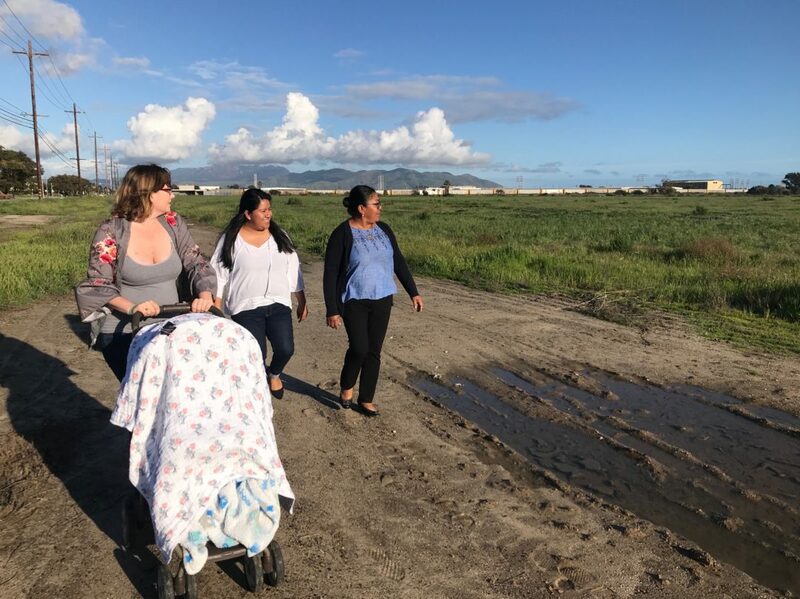 In the past, city officials have talked of turning the lot into a public park, a project that would finally provide local families with access to the coast. Now, a proposal by the Port of Hueneme to turn the lot into a storage facility for imported cars threatens to upend that dream. Community members and local advocates say the plan—which envisions transporting up to 76 cars most weekdays to the facility and storing almost 5,000 cars at a time—would effectively cement a wall of heavy industry between South Oxnard residents and the beach. Many see the plan as the latest example of a pattern of disregard for poor communities living near California’s ports. These neighborhoods are often saddled with disproportionate amounts of industrial pollution compared to more affluent locales further away from port facilities. And as these ports expand to meet the demands of international trade, the inequities are getting worse, advocates said. About 15 percent of Oxnard’s residents—more than 30,000 people—live in Southwinds, making it one of the most densely populated neighborhoods in the city, according to Kelly Christiansen, vice-chair of the local neighborhood council. Many of these residents are indigenous Mexican immigrants who work in nearby agricultural fields and other low-wage jobs. Air pollution has long been part of daily life for people in Southwinds and South Oxnard generally. Neighborhoods stretching from the port into Oxnard are exposed to some of the highest levels of diesel emissions in the state. Zucker said much of this comes from shipping and truck transportation to and from the port. This combines with pollution from other nearby industries and pesticides from local fields to create a “toxic soup,” he said. Oxnard communities have some of the highest asthma rates in Ventura County. Christiansen said she regularly sees kids with inhalers at Southwinds Neighborhood Council meetings. Carolina Gallardo Magaña, who chairs the council, said her son, daughter and nephew all had asthma growing up. Vega and her younger sister also battled the condition. The advocates fear that adding the car storage lot will aggravate the pollution problem as more vehicles are shipped in, and cars and employees are shuttled back and forth from the port, past local schools, parks, houses and a health clinic. Port officials insist the storage lot won’t add to emissions. Dona Toteva Lacayo, the port’s chief commercial and public affairs officer, said taking cars to the lot—which is just a few miles from the port—would ultimately reduce pollution. That’s because right now the port is running out of space to store vehicles while they wait to be processed. Some are trucked to Ventura and Camarillo to be stored and then moved back to the port, she said. Being able to store the cars closer to the port cuts down on emissions, especially as imports increase, she said. Lacayo said having the storage lot would also help the port remain competitive, and will create 30 permanent jobs, such as for drivers and security guards. As far as the idea of creating a park in the space, Lacayo said that can still be accomplished. The port is applying to use the lot temporarily, for up to five years. Eventually, the port hopes to build an even larger storage lot a little further along Hueneme Road, also in South Oxnard. That could leave the current proposed site available to be turned into a park, she said. But Christiansen and other residents aren’t convinced the site will be temporary. Some also worry about the larger storage lot plan, which they fear could further exacerbate pollution. The Oxnard planning department has ruled the project won’t cause environmental harm, provided developers comply with a few mitigation requirements, such as doing the construction work outside of breeding season so that nesting birds aren’t disturbed. They say the project does not require a full environmental impact study, a conclusion that opponents vehemently disagree with. Oxnard’s Planning Commission is expected to decide whether or not to approve the project in the next few months. If the decision is appealed, it will go before the city council. Meanwhile, members of the Southwinds Neighbohood Council are doing what they can to inform residents about the project and encourage them to speak up. They’ve organized meetings, sent a petition to the city, and urged people through social media to write letters opposing the project. Vega said a challenge for the neighborhood is that many residents are not well informed or are reluctant to speak up. Often they don’t speak English or even Spanish since many are indigenous Mixtecos, making it difficult for them to understand what’s happening at the city level and to communicate their needs. Fear is another barrier, she said, since the community is home to a significant proportion of undocumented immigrants. Yet when she tells her neighbors about the project, they don’t like what they hear, she said. South Oxnard isn’t the only community facing these types of challenges. In San Diego, low-income neighborhoods near port terminals also face high amounts of pollution from ships, diesel trucks and traffic, said Diane Takvorian, executive director of the Environmental Health Coalition. In 2016, a proposed expansion of the Port of San Diego’s terminal in the historically Chicano Barrio Logan threatened more contamination. Community members fought the plans and worked with the port on an agreement to reduce the size of the expansion by about 25 percent, and to electrify cargo-handling equipment and put emission control devices on ships, Takvorian said. Her organization is now pushing for a zero-emissions plan that includes electric trucks for transporting goods to and from the port, she said. The Port of Hueneme has also been working to reduce emissions. They’ve installed LED lighting, and a shore-side power system that allows docked ships to plug into electricity and turn off their diesel engines. And they just won a $3 million grant from the California Air Resources Board to work on electrifying port equipment and obtain a hydrogen-fuel-cell truck to transport fresh produce to market. But Zucker said driving gas-powered cars to and from the port to be stored will continue to affect air quality. Southwinds Council Vice Chair Christiansen said she hopes the city will reject the parking lot proposal in favor of creating the park.